As much as we like to write about “new” resources, sometimes we need to discuss resources that have or are in the process of disappearing. I wrote about Urlist back in August 2013, urlist + Genealogy = Neat Discoveries. 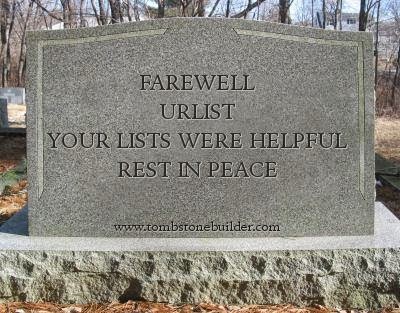 After three years of service, Urlist will be discontinued on December 31, 2014 at 1:00PM UTC. To download your data, please visit the Urlist website at http://urli.st/ and log in; you will find a button on the top of the page to download all your links. You can read the full message here. Before it’s a fleeting memory, you might check out the genealogy lists that were posted; maybe there will be some neat resources new-to-you waiting to be discovered. Additionally, later this week, the FamilySearch Photoduplication Services will be discontinued effective 5 December 2014. We previously wrote about this service in February 2013, Policy Change for Patrons Requesting Photocopies From the Family History Library in Sale Lake City, Utah. As more microfilm and books are digitized and added to FamilySearch.org, and more links are made available to partner sites that already have this information digitized, the need for photoduplication will decrease. Are there any other websites or services which have recently disappeared or are scheduled to do so that we should be aware of?